Place 1 jar of DeCecco Pesto in a glass bowl. Add halved grape tomatoes and olives. Stir gently to combine. Bring 6 quarts of water to a boil in a large stockpot over high heat. Add the spaghetti, stir, and cook for 7- 9 minutes, until the spaghetti is al dente (“firm to the tooth”). Drain the spaghetti and add to the bowl with the pesto. Toss gently; the heat of the spaghetti will melt the pesto. Heat sauté pan and add 1 tablespoon of grapeseed oil. Season shrimp with salt & pepper and add to pan. Cook until shrimp turn pink about 3-4 minutes. Add shrimp to pasta in bowl. Add zucchini to pan and sauté quickly until squash softens slightly but is still firm. Add to bowl and top with grated cheese. Toss gently and adjust seasoning. Serve in pasta bowls, topped with grated cheese and a swirl of Extra Virgin olive oil. Enjoy with a side salad! 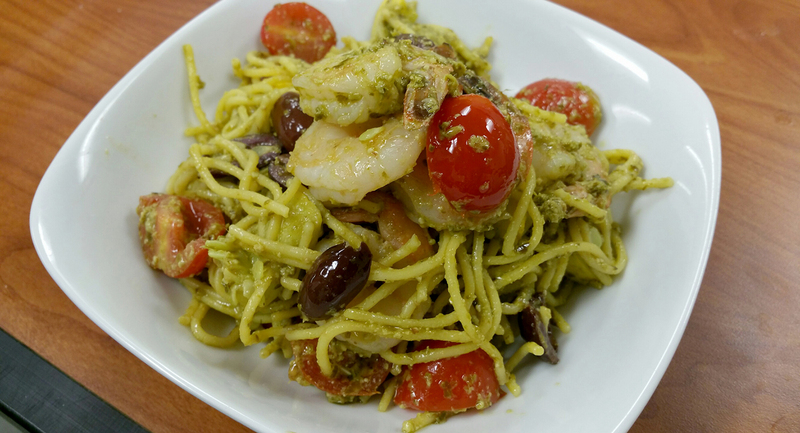 This entry was posted in Entrees, Recipes and tagged Dietitian, Entree, Gluten Free, MEAL OF THE WEEK, olive, pasta, pesto, Recipe, Seafood, Shrimp, SPAGHETTI, squash, zucchini. Bookmark the permalink.